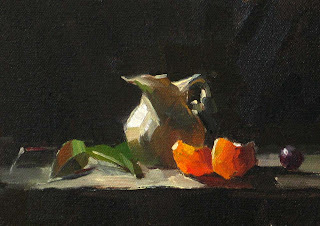 I am on my way to Sacramento, CA to teach my first workshop of 2010. I usually I go to northern CA every spring attending the Photonics West International Conference and Trade Show at the Silicon Valley, But this trip is purely for art. It feels so different. I will be back to Austin next Tuesday. Any sold paintings will be shipped after I come back. I will also let you know what happening on the west coast. My experiences in painting have told me that having good art teachers is crucially important, especially for beginner artists. In order to promote high quality art education in the central Texas area, my wife and I decide to start a new endeavor in art. 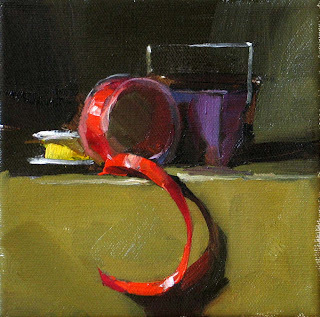 We will invite artists selectively coming to Austin to give workshops. 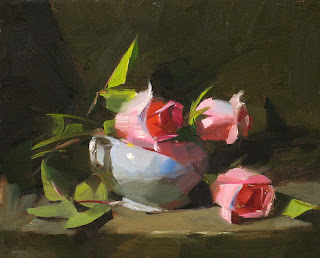 I am very happy to announce that the well-known California artist Calvin Liang will give our first invitational workshop. 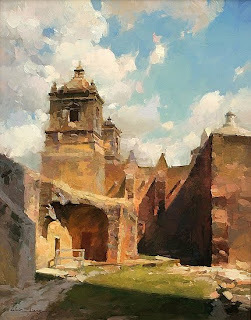 He will teach a 5-day plein air landscape painting workshop on October 25 – 29, 2010. If you are interested in learning from Calvin, please check the workshop flyer. This workshop has been limited to 15 students. Please contact Yuehong Song at yuehongsong188@yahoo.com for detailed information and registration. Thanks so much for your attention. I got so many feedbacks on my white cup painting. I wish I could reply all your kind emails and comments personally. Thank you all very very much. I will practice what I learned from you and report to you in the near future. At this moment, I just want to share one thing that I have learned. The major reason I did not see much colors on my white cup was my light. I am using a color corrected spot light. 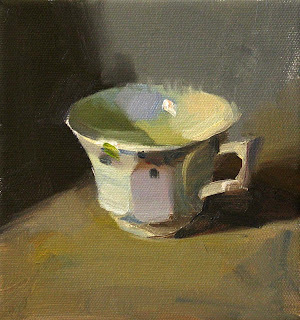 The light was so concentrated on the object and environment surrounding it was in dark, so I did not have different colored light reflected into the cup. This friend suggested I should look at my object under daylight, and I did. It was strikingly difference. Now I got some idea to improve my illumination, and I will demonstrate to you later. I named my today's painting "Blue Monday" maybe not very relevant. It reflects more my mood today rather than the painting. I am a little blue today, but it is all right. Life goes on and more paintings will come out. Painting color from a non-colored object has been a big challenge to me. I have tried and tried many times painting a white cup, but I don't think I have got it. This one is another try. I stared at this stupid cup for about two hours, and I really did not see much colors from it. But I don't want to do another value painting any more. So you see quite a few colorful grays on the cup. Those are colors in my mind. I will keep trying until I figure out how the color of grays are formed on a neutral color object. If you know the trick or you know some one is good at it, please help me out. 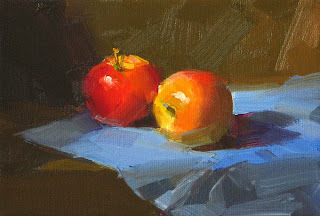 Using temperature contrast to enhance the colors at the center of focus is an effective method to make the painting looks more colorful. I love holidays. This long weekend makes it possible for me to paint daily. Many people asked me: how can you do so many things? 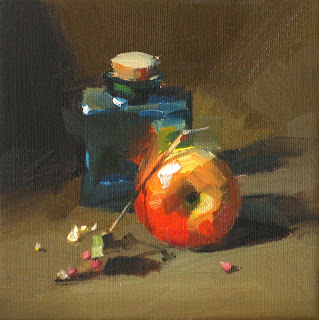 You work full-time; have a family, and you still have time painting, teaching workshops, and managing an art business. Be honest to you, I CAN'T, but I try my best to use every fragment of time possible. At my day job, I do not go out for lunch, so I have some time to check emails and posting on my blog. I hardly watch any TV, and use my evening as much as possible. Weekends are luxurious. I really enjoy being a full time artist for a day or two. I am not ambitious and let thing happen naturally. Do I recommend my life style to others? Actually, NO. This fast paced modern life is very unhealthy. Life should be more relaxed, having more time for leisure. I am having this fast-food kind of life now in order to have the opposite in the future. So wish me luck. Another week without painting passed by solidly. I was rat racing in the labs in Texas and New Jersey. Perhaps my boss has found my negative words in my earlier posts toward corporate culture, and planned to punish me deliberately. I was given a work load so unrealistic that I will fail for sure and look bad. 3000 feet above sea level, among IPhone fumblers and laptop gazers, I opened "The Good Life" by Helen and Scott Nearing. A glare of the Sun was reflected to my eyes from a tiny speck of water surface down there. Maybe it was from the "Walden Pond". Men! the picture I was in was absolutely surreal. People have to be crazy to be normal....... I forced myself and did this small painting late Friday night. Can you believe it? I didn't get a chance to touch my brushes for an entire week. Art can be killed just like that. I was so busy tweaking optics in my lab that I even have no time to check my emails during the day. If you are more lucky than I am, please help me to paint more. If you think you could wait till tomorrow to paint, please pick your brush today. We are obligated to make this world more beautiful. 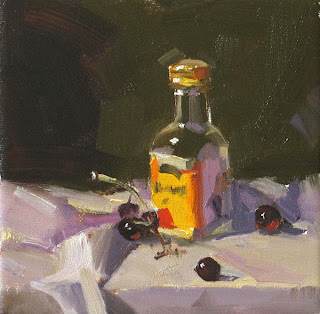 Finally on Sunday afternoon, I did this small painting. I am still in the mode of doing low key paintings. I was testing of using translucent light as my center of focus. I think it works well. Now the holiday season is over. I am back to my cubicle babbling technical jargons. This is the last painting I did from my holiday break. It will be sent to a gallery show. I keep the background rough deliberately. Do you like it? My paintings recently are kind of tight. I am going back and forth, looking for my balance point. 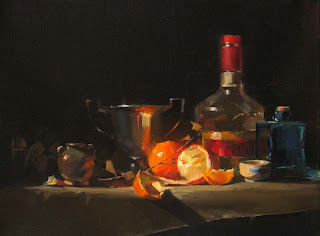 Sometimes, tight paintings are good, but I prefer looser styles. Happy 2010! 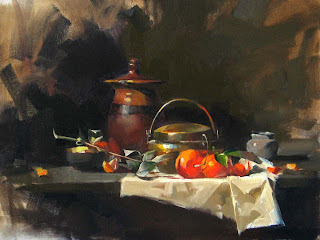 I opened my mailbox this morning and very excited to see a certificate from the Oil Painters of America. It is my OPA signature membership. Now I am allowed to put OPA after my name. What a wonderful new year gift I received. This is an import milestone. I did this gallery painting on the first day of the new year. I might send this one to this year's OPA national show.